When I woke up this morning at 6am, the media and online community were in a complete frenzy. Michael Jackson - who needs no introduction whatsoever, went into cardiac arrest and was taken to hospital. I was checking the news every few minutes for updates on the situation. While I was getting ready for work, I read that MJ was reportedly dead. ("Reportedly"?) The next update was that the superstar was just in a coma. Ok. Brief sigh of relief. 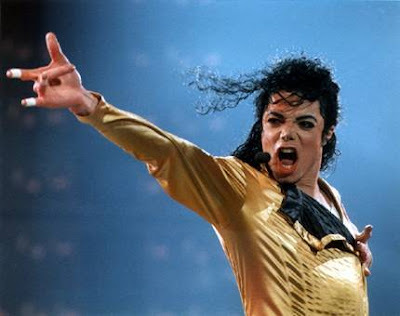 I wasn't a die-hard fan of MJ, but the man definitely was the King of Pop. Sure, he faced an enormous amount of grief during his life, but underneath all that - he was legendary. No one can dispute that. Throughout the day, I was reading news snippets and messages of condolences from fans all around the world. I felt heartsore reading it. And I thought that's it's truly amazing how ONE person can affect the entire world. How amazing it is that we all feel connected to him in some way or another. As 5FM radio personality, Sasha Martinengo said, "Perhaps I now understand how people felt when Elvis Presley died." I completely agree. I think back to other icons who lost their lives during my lifetime - Princess Diana / Mother Teresa. The world literally came to a standstill. Sadly, to this day Princess Di is still being hounded by the press about her death and events leading up to it. Regarding MJ, already headlines are reading: "Michael Jackson leaves hefty debts"
I didn't expect to feel so affected like this. But I am. I was really occupied at work today, but I wasn't myself and felt hazy. I'm at home now, and didn't go to the gym. I know that if I go, my mind wouldn't be focused on my exercise. Also, there's no one around me here who will be able to empathize. Last month the former president of South Korea committed suicide. The entire country was in mourning. Of course, I couldn't really understand the deapth of sadness that my Korean colleagues felt. The same can be said for the feelings of today. Anyways, I won't bother posting news stories on my blog. Every single news site is headlining MJ's death as breaking news. If he wasn't considered as one of the best selling artists on the PLANET, would his death be "breaking news"? Naturally, the Jackson family will be zoomed in by the entire world. Apart from being a top entertainer with a career spanning 4 decades, he is/was just a human being - with parents and siblings. And if anything, we should respect their privacy and allow them to grieve in peace.